It's 2007, and I've just learned how to play Magic. I ask my friend what I should buy first, and he asks me what colors I like. I say, "I don't know, red and blue?" It's 2019, and I'm a contractor for Wizards of the Coast. I send an email to Blake Rasmussen, Editor-in-Chief of DailyMTG. I ask him if I can preview a weird card from War of the Spark on Twitter. He responds, "Would you like to write a weird article instead?" I'm Chris Mooney, and I love Weirds! Join me today as (in true Izzet fashion) we jump forward, backward, and sideways through time to learn about Magic's weirdest creatures. It's 2006, and Guildpact has just been released. Players around the world are being introduced to the haunting Orzhov, the bloodthirsty Gruul, and the . . . replicating . . . Izzet. Among the cool and quirky creatures of the Izzet league are Goblins, Faeries, Giants, Dragons, and . . . Weirds? What the heck is a Weird? 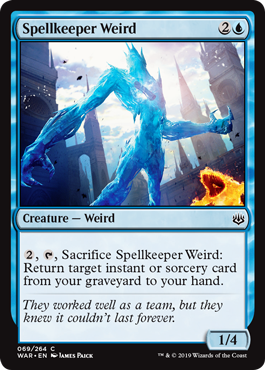 A Weird is an Izzet creature created by combining two (or more) elementals into one being. For instance, our friend Steamcore Weird is a fire elemental encased inside a water elemental. Weirds are wild contradictions that somehow manage to work, which, to be honest, is how I feel about myself a lot of the time. 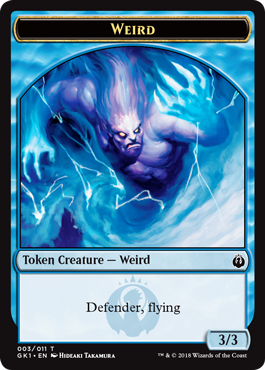 Weirds represent the core of what I love about the Izzet: they're deterministically unpredictable, made both by logic and in spite of it, a living embodiment of creativity. Plus, they've got sweet art! It's 2018, and I've just been told I made it to the Top 8 of Great Designer Search 3. I need to choose a piece of card art to represent myself. I ask all my friends to pick the card that they most associate with me. Every single one of them says Gelectrode. Gelectrode was an all-star of my first deck, a Guildpact theme deck named "Izzet Gizmometry." I owe a lot to Gelectrode. It's the card that helped me learn how the stack works. It's the card that taught me the power of building a deck around a specific theme like instants and sorceries. And, perhaps most importantly of all, it established that Magic card names could be puns. Honestly, there was no turning back after that last part. It's 2005, and artist Hideaki Takamura turns in the final piece of art for the card Thunderheads. He also turns in art for a matching Weird token. Thunderheads gets printed the following year. The token won't be printed for another thirteen. You see, back in 2005, creature tokens weren't included in booster packs like they are today. For over a decade, the only way to see Takamura's awesome Weird token art was on Magic Online. These weird tokens lived online for many years, seen only by the most diehard of Weird fans (like me) and blue Guildpact drafters desperate for a 23rd card (also me). I dreamt of owning a real copy of this token, but I had pretty much written it off as impossible. After all, what kind of product would want to reprint Thunderheads? It's 2018, and the Guild Kits arrive to answer my prayers! These preconstructed decks included cards from all three Ravnica sets, as well as matching tokens. Now, thirteen years later, the wonder of these physical Weird tokens are finally available for us Weird fans to behold (and, you know, actually hold). It's 2012, and Return to Ravnica also brought us a return to Weirds! This time, the Weirds came as a vertical cycle of hybrid creatures. At common, we had Frostburn Weird, which was a solid card in RTR Draft with a lot of flexibility. At uncommon, we had Blistercoil Weird, which was part of this set's uncommon one-drop hybrid cycle alongside some more memorable cards like Dryad Militant and Rakdos Cackler. And at rare, we had Nivmagus Elemental. Wait . . . Elemental?! Why, that's no Weird at all! What gives? Did the Izzet not have another elemental on hand they could fuse with this one before it escaped? The purpose of Nivmagus Elemental's non-Weirdness has haunted me for years. My only solace comes from the fact that Nivmagus Elemental's Elemental-ness did actually matter when, later that year, Team StarCityGames tutored it up with Flamekin Harbinger in the Modern Pro Tour. It's 2019, and I'm still confused by Petrahydrox. It's 2013, and the world gets to meet the first-ever legendary Weird, Melek! Dragon's Maze also brought us two other Weird cards. One is Fluxcharger, but the other is a bit harder to find. That's right, the Turn half of Turn // Burn transforms a creature into a Weird! I enjoy how the fuse mechanic connects to the Weirds' identity of being multiple elementals fused together. It's 2019, and you open a Weird creature in your War of the Spark booster pack. Wait a minute, I think we went a little too far into the future . . .
And now, without any further ado, please give a very warm, very weird welcome to . . . Spellgorger Weird! Spellgorger Weird might start out small, but like any good Izzet creation, it can get out of hand pretty quickly. Normally, you'd want to grow your Spellgorger Weird with a healthy diet of instants and sorceries, and maybe a few artifacts and enchantments for flavor. But War of the Spark is not a normal set, and, personally, I look forward to using my planeswalker cards to give this little guy a boost. Wait, what's that in the background? 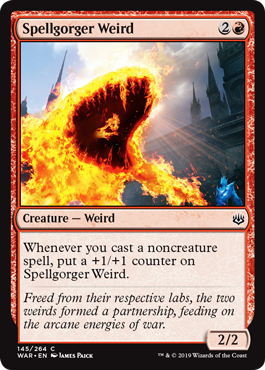 Does the flavor text say "two weirds"? That's right, Weird fans! War of the Spark brings us not one, but two new Weird cards! What Spellkeeper Weird lacks in raw power it makes up for in flexibility. Early in the game, it can help protect you and any of your planeswalker friends. Later on, you can cash it in to get back your most exciting instant or sorcery. Weirds will always have a special place in my heart. They're one of Magic's many unique quirks that add to its charm, and I hope that all of you out there will enjoy playing with our two newest friends.